What better way to start off the weekend than with Amish Friendship Bread Pancakes, fresh off the griddle? This recipe is light, fluffy, and a fast favorite. In a small mixing bowl, combine starter, oil, milk and egg. In a large mixing bowl, combine flour, salt, baking powder and baking soda. Create a well in the center of the dry ingredients and pour the starter mixture in the center. Using a hand mixer, mix on medium until incorporated. Spoon batter onto a skillet or a greased griddle over medium heat. Cook until bubbles appear on the surface, then flip and cook until browned on the other side. Add 1 cup fresh or thawed blueberries, strawberries, or bananas. Add before flipping pancakes over. From K Brown: "Add cinnamon chips before flipping the pancakes. These turn out light and fluffy." From Shari:"For a whole-grain variety, use whole wheat flour, rolled oats, and wheat germ with added vanilla and cinnamon." tried some different things pancakes are good . I have the book read it shared it and may read it again soon. can’t wait till the next book comes out and the web site is wonderful lots of good ideals. My family loved these pancakes. They were light and fluffy. The only thing I changed was adding cinnamon chips to the pancakes before I flipped them. Burnt my first batch and used starter from day 8 and they still turned out amazing! I added almond extract! Yummy! Ha, I have Herman hiding right here in my fezeerr. I wrote half a post about Saving Herman about six months ago and never finished it. Have to say, he was in very poor health when he came to visit me and the medication that was advised was baking powder. Baking powder? So I tried to get him to be a healthy friendship cake and turning him into a real leaven starter. Only thing is I forgot about him until now oops! Just made a big batch of these to use up my extra starter and I plan to freeze them for quick breakfasts! Snuck a few tastes and they are great! I used fresh-ground whole wheat flour and they have a lovely texture and taste. Made these this morning with a little cinnamon and vanilla. Very tasty without any toppings but great with homemade chokecherry syrup. Loved these pancakes! Topped with blueberries and crumbled bacon…yum! This will likely be the first recipe I make with the starter. My mom used to have a starter recipe, back when I was a kid, that was very similar, if not the same. It was called “Herman.” Herman made the absolute best pancakes and I have missed them. They were my favorite! These are my favorite pancakes! I add a little vanilla & coconut flavoring. They’re so good I don’t even need syrup. I also love them with thinly sliced banana. I they also freeze well & do great in the toaster for the re-heat. You should definitely try them. Can 1/2 c buttermilk substitute for the 1/2 c milk? We all know how yummy buttermilk pancakes are but maybe it’ll cause “too much activity”? Hi Bob, thanks for your question. Yes, you can swap this 1:1 and it’ll be just fine. The extra lactic acid will boost the sourdough flavor. Snap a picture if you make it — we’d love to see how it turns out! My family loves pancakes and this will be a nice variation on what we do now. 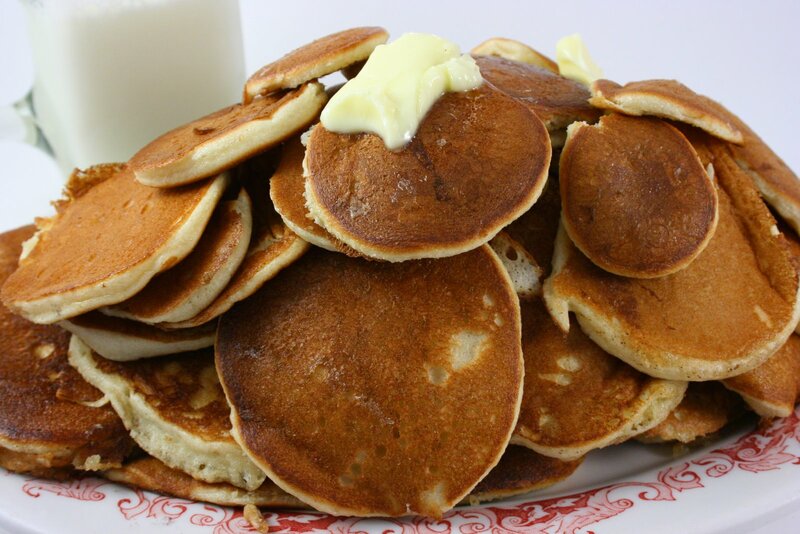 I plan to use my Friendship Bread starter to make these pancakes for my son-in-law Max and for my hubby Bill. I know that the starter will contribute a delicious kick to the usually bland pancakes. These would be great to make over Christmas while my daughter is home. Hopefully an old friend will be able to join us too. Thanks for sharing this. These were the best pancakes I ever made so yummy. 1. Treat it like it’s Day 1: Run through the 10 days as if you had received your starter from another person. 2. Treat it like it’s Day 6: Add one cup sugar, one cup milk and one cup flour. Squish for the next four days and then follow the directions for Day 10. 3. Treat it like it’s Day 10: Bake once the starter is thawed, about three to six hours. 4. Treat it like it’s Day 10: Bake once the starter is thawed, about three to six hours, add 1 ½ cup each sugar, milk and flour. Mix well then divide into 1 cup bags to give away (or re-freeze). Continue following the instructions for baking. Basically, you can just bake with it, or you can feed it and continue on the ten day cycle. To learn more about freezing/thawing starter, you can read our “Reviving Frozen Amish Friendship Bread Starter” tutorial here. So glad that you enjoyed the Amish Friendship Bread Cinnamon Muffins. Happy baking!